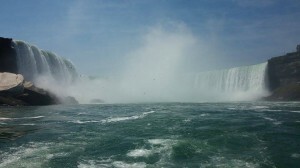 Niagara Falls offers a city filled with arts and incredible live shows. Catch them at these great venues that have been home to Niagara’s art and theatre scene for years. Greg Frewin Theatre: See master illusionist Greg Frewin take on the world of magic at one of his famous shows. His illusions will captivate you and the appearance of his tigers makes for an unforgettable experience. Sit back in your chair and be prepared for a show of a lifetime! Shaw Festival: This modern theatre takes on classic plays right in the heart of Niagara-on-the-Lake. Grab a glass of wine before the show and get prepared to see some of Canada’s best performers hit the stage. The festival holds 10-12 plays annually, which gives you several opportunities to see some of your favourites! Oh Canada Eh? Dinner Show: Embrace the Canadian in you by visiting the Oh Canada Eh? Dinner Show. The musical includes some of your favourite characters throughout Canada’s history and an evening full of laughter and fun. Enjoy a family style meal at Niagara Falls’ attraction of the year! IMAX Theatre: Check out the adventurous films that play at the IMAX theatre for a memorable experience. See the falls in glorious IMAX during the Niagara: Miracles, Myth & Magic film that delves into the history of the waterfalls. Close to many of the other attractions and hotels means you won’t have to go far to catch this one. For the art and show enthusiasts coming to Niagara Falls, put a stop at one of these locations on your itinerary!